Saturday 12/20 at noon PST. Hosted via G+ On Air broadcast. There are as many paths to publication as there are authors. How do you know which path is right for you? In this workshop, we’ll explore the new evolutions in traditional, indie and hybrid publishing. We’ll talk about the pros and cons of various approaches and how you may utilize one or many methods of publishing to achieve your publishing goals. This event is free and will be recorded. About Kelsye: I’m an author, publishing consultant and Digital Publishing instructor at the University of Washington. I help authors across genres publish their books, including helping with launch strategy, interior layout, cover design, publishing on various platforms, marketing and author platform building. I have worked with Amazon Kindle Direct Publishing, CreateSpace, Google Play, Blurb and many other publishing tools. I have publishing industry knowledge, publishing experience with emerging technologies, technical expertise, and business and teaching experience. Learn more here. Want more help self-publishing? Enroll in my course: Self-Publish Your Book in 30 Days. Do you have questions about book marketing? Join me for a live, half-hour book marketing Q&A session. Wednesday 12/17 at noon PST. Hosted via G+ On Air broadcast. Get immediate answers to your book marketing questions. Ask about free promotions, does paid advertising really work, selling on social media, or whatever you wish. How cool would it be if your readers could listen to thoughtfully crafted soundtrack perfectly aligned to your book as they read? Booktrack makes this possible! Join me in a free webinar on October 9th to learn how you – and your readers – can create soundtracks for your favorite books with Booktrack. RSVP here. What the heck is Booktrack? Booktrack synchronizes soundtracks to eBooks creating a new medium for reading. With Booktrack, a unique soundtrack is paced to an individual’s reading speed and synchronized to match the storyline while they read. Readers get instant free access to thousands of stories, from famous classics to contemporary titles, while authors easily create their own Booktrack titles by matching their stories to an extensive library of over 20,000 free-to-use high quality music and ambient audio tracks. Published Booktrack titles become instantly available to a global audience across Booktrack’s online service and mobile apps. Booktrack is delivering an innovative and engaging experience for today’s generation of digital readers, providing new ways for authors to evoke emotion and bring scenes to life, while additionally demonstrating proven learning benefits. Booktrack is seen as a disruptive force in the publishing and audio world, equivalent to how the introduction of sound changed the experience of watching film forever. Want to win a video trailer of your book expertly crafted by the Booktrack team? Enter the raffle below to win one of two free book trailers. Check out the ones they made for Hugh Howey’s Sand and Pittacus Lore’s Power of Six. Come to the writers’ campfire! Sign-up to read or bring things. << Do it! Hooray for summertime! I invite you all down for a campfire on the beach. This event is hosted by the Seattle Daylight Writers and open to everyone. We’ll cook various edibles on sticks, take turns at an open mic (um, no actual mic), play low-pressure writing games and watch the sun set. PLUS, Seattle-based singer-songwriter Rachel Wong will be playing some songs for us half-way through. What’s a campfire without a song?! What to bring: Yourself. Friends. A five-minute or less piece to read. Food to eat or share. Pen and scratch paper. Perhaps a chair. How to find us: Look for the tiki torches! Fire pits are first-come, first-serve. A few of us will arrive early to save a spot, but we won’t know exactly where we’ll be until we grab it. We’ll erect tiki torches so you know which hoard to head for. While there is no need to RSVP, you’re free to do so at the Daylight Writer’s Meetup event page. A writing community? Yep! Watch the video to hear why connecting with a group of supportive writers will serve you well in your publishing career. Want help connecting with ONLINE community? Here’s help for building community on Twitter. I’d like to invite you all to a special presentation I giving next week in Seattle. The Seattle Free Lances association is hosting my talk, Ten Things to Do Before You Publish. Tip: If you enter the promo code friend, the price drops from $40 to $22, plus you’ll still get the free wine and cheese. Excellent! Get tickets here. Just as a field of tulips is the fruition of plans, labor and materials, so is successful book publishing. Kelsye Nelson’s workshop covers ten things to do before you publish — ten things to propel you to success through your entire writing career. Agents and publishers now take a good look at a writer’s online presence, website, social media, network and community when deciding to take a chance on a new author. And if you publish independently, you absolutely need a strong author platform. Luckily, with the free tools and resources Kelsye covers, it isn’t hard to give your books their best chance for success by building a respectable author platform with minimal investment of money and time. Starting from scratch? No problem! Let Kelsye illuminate your path. Already have an author platform established? You’re ahead of the game! Come pick up some new tips on how to optimize your online presence and get the most help from your real-life community. Kelsye’s a wiz at this. BONUS: Kelsye also shares insights on how she raised $9,800 on KickStarter last month to fund her non-fiction book project — and attracted an agent at the same time! A once in a lifetime opportunity! Become a backer of my Book Lush campaign at the Betty McDonald level and you will receive a five-day stay at Betty’s cabin. This is the cabin featured in Betty’s book Onions in the Stew. Although, you may know Betty best for her book The Egg and I, or her Mrs. Piggle-Wiggle series. Gorgeous. There is no way I could express in this blog post the beautiful and magic of this place. You enter the cabin on the east end, through a wooden door in a stone wall that remind me of Snow White’s cabin. Once in, you open door after door to discover new wings and rooms. Mornings are best spent on the wide porch perched above Puget Sound, where you can sip you coffee and watch the otters swim by. Inspirational. If you happen to read Onions in the Stew during your stay, you’ll appreciate Betty’s dreaming of one-day being able to improve her house with income earned by her books, and how she would put a fireplace in every room. How empowering to be sitting before those very fireplaces she wrote about. Flexible. You may choose to come for a solo stay to work on your writing or general meditations on life. You can bring along a lover to share those nights in front of the fireplace. You can even choose to bring a group – perhaps even your kids! The cabin is located on beautiful Vashon Island, just a ferry ride away from Seattle, WA. Waterfront! There is about 300 ft of beach right in front of the cabin. “Cabin” is an overly-quaint descriptor for this house. The house features 4 bed rooms, 4 bathrooms, a large dining room with a table that seats 12, a lovely grand room with a giant stone fireplace, plus another side house that sleeps 4. Bring your own wifi. The cabin is modern and features quality appliances, heat and electricity. This must be redeemed in 2014. Scheduling will be worked out with the cabin’s owner, author Abigail Carter. The house has a fully equipped kitchen. All you need to bring is food. Cost: $1500 backing pledge on my Book Lush kickstarter campaign. Become a backer here! This is the second Book Lush meetup. We had such a great time at the first one, we decided to open it up and invite everyone! The live events offer a stimulating evening of good book recommendations and excellent craft cocktails. 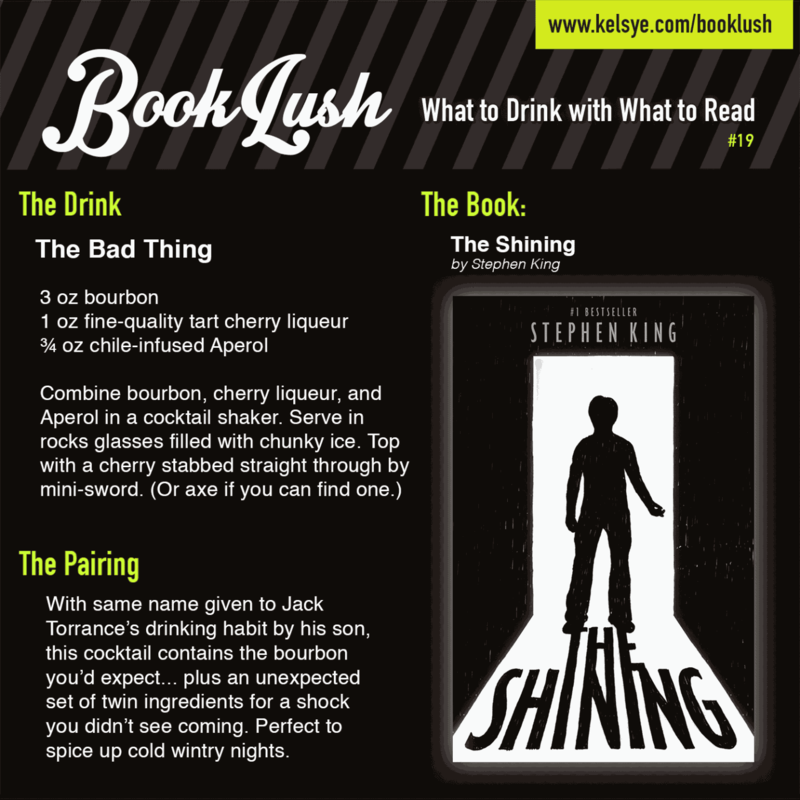 Bring a book idea for the bartender to match with a drink. Plus, we’re going during Liberty’s happy hour. Bonus! Opened in 2006, we are constantly striving to provide our neighborhood with a great place to stop by, relax and enjoy outstanding spirits, cocktails, beer, wine and sushi. Our primary interest at Liberty is our expansive liquor menu and our scratch cocktails – meaning that each and every cocktail is made with fresh juice when you order it, not from juice pressed earlier in the day or simply poured from a can. There’s no comparison between a scratch drink and any other – and you should expect no less. Please feel free to ask your bartender or server to assist you in choosing a liquor that you may never have tried. At any time we have over 85 Bourbons and Ryes, 100+ Scotch, Japanese, Indian, Irish and Canadian Whiskies, and a premium selection of 40+Gins, dozens of Vodkas, 50+ Tequilas and 20′ish fine Mezcals in addition to quality liquors, some made here which we use to create our classic and original cocktails. See all the details and RSVP here. Or, if you’re into Facebook, we do that too. If you are one of the lucky people attending the AWP conference in Seattle today, stop by the Writer.ly table before 1pm today. I will be matching books to drinks in person. I would love to see you! Not in Seattle? Take a look at the Book Lush project online.